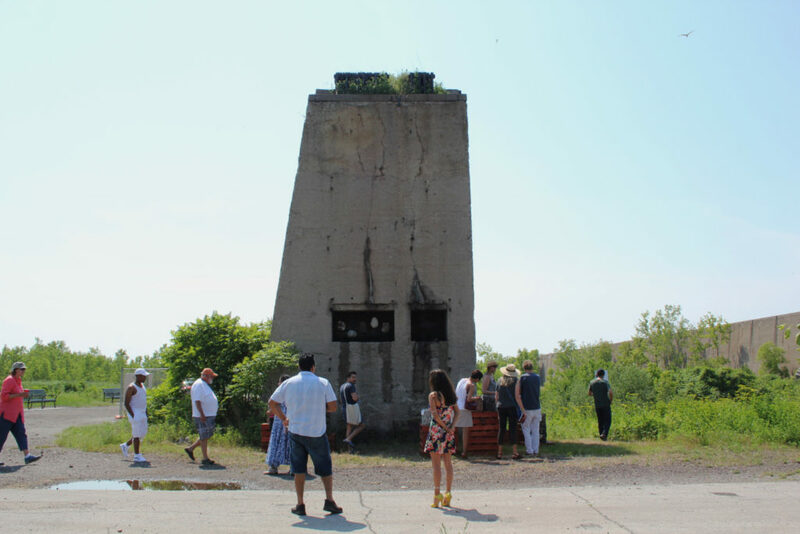 Early in the afternoon on the day of her installation’s opening, Stella Brown is standing by the end of one of the mammoth concrete walls at the site of U.S. Steel’s former South Works plant, on the lakefront at 87th Street. Two local residents approach by bike; they say they’re frustrated that the park district decided to spend money on an artist—from outside of the neighborhood, no less—rather than on other much-needed facilities, like restrooms. Brown acknowledges the problem, says it’s indicative of bureaucracy, and offers that she tried to get a Porta Potty for the opening event. A temporary fix, though, is not what they want. Brown says she’s inserting herself into a dialogue about the anthropocene, the name for the geological epoch during which humans have had a significant effect on the earth. 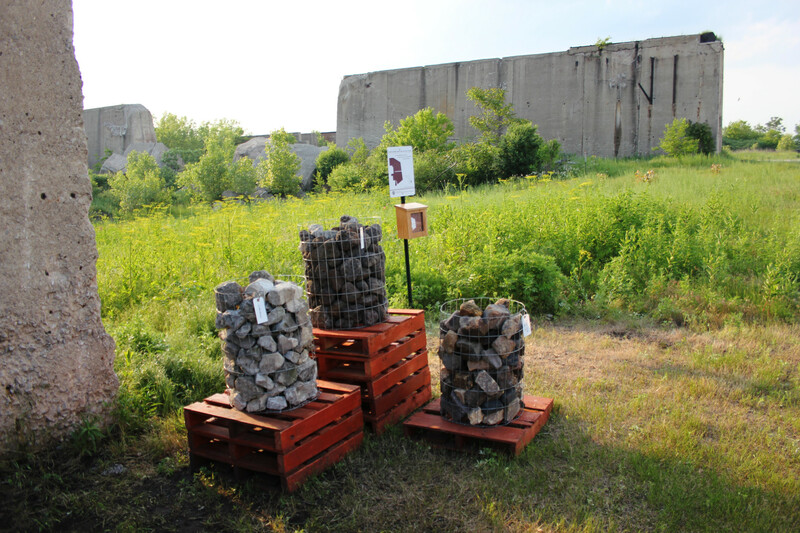 Brown’s installation, “South Works Deep Geological Study,” consists of industrial detritus, gathered from the area around the walls, which line the 2,000 foot-long slip where boats carrying iron ore once docked, splitting the 440-acre South Works site in half. Since Steelworkers Park opened in 2014, the eastern quarters of the walls are parkland. Closer to shore, U.S. Steel maintains control. She spent a few days with friends, scouring the site for artifacts of human intervention. The results were sorted, piled, and wrapped in wire—there’s concrete, smoothed by the lake surf; iron pellets; and chunks of slag, both iron and steel. A few larger chunks are displayed in an indent in the end of the ore wall’s end, mounted on rebar. “I wanted to bring a sense of importance and curiosity to them, and through that make people more interested in the site,” Brown says. But for newcomers who confront the walls, curiosity is in no short supply. And for longtime residents, the space already holds a strong sense of importance as the former site of 20,000 jobs. Ringo Garcia grew up around the neighborhood, and his father worked in the mill. He’s seen the contents of the installation before, and the walls. “To me it’s just a bunch of rocks… would I be [admiring these rocks]? Raising five kids, working every day? I’d just kick them out of the way,” he says. Next to the installation is a stand, stocked with pamphlets researched and written by Brown, with covers mimicking the National Parks Service’s signature style. Inside is historical and geological background, thoughts by the artist, and a set of interviews with local figures. What were they for before? Some of the crowd at the installation opening marvels and speculates. Others know all too well. Iron ore would be shipped in and stowed between the massive concrete walls before being processed into steel at the South Works plant. Craig Pfinster remembers, as a child, the sky over that section of the city blackened with factory smoke. His father worked for U.S. Steel. At the opening, Pfinster and Patty Lawson gather around Brown’s work, toying with a magnet, marveling at the weight of the small chunks of iron and steel slag. “You’re not good enough!” Lawson chastises the lump of slag. Pfnister , chimes in. “Ya didn’t make the cut.” He giggles. If they hadn’t been discarded, maybe the chunks would comprise steel beams holding up skyscrapers downtown. The two laugh and walk over to the mouth of the ore wall canyon, looking out at the vegetation. A spectator mentions that the landscape looks like something out of The Maze Runner, or some other young-adult dystopia. Brown’s mother, Gretchen Brown, had the idea first, scouting the location as a set piece for Divergent. Part of the apocalyptic appeal of the place is, as Brown points out, the allure of an extinction fantasy. It’s suggestive of what the city might look like if, empty of humans at some indeterminate future time, left to be reclaimed by whatever flora and fauna are up to the task. As long as humans rule the city, attempts to repurpose or speculate on the future of South Works feel inevitable. Two developers have tried, though thus far both plans fallen through: in 2016, McCaffery Interests scuttled a plan to build a $4 billion neighborhood. Then, just this May, a month after reports of soil contamination threatened to hold up the project, Irish developer Emerald Living halted work on a mixed-use 20,000-residency development. To some current residents, these plans are an affront. Why build a new bedroom suburb for commuters to downtown when what’s really needed is work? The sting of the abandoned plans for a Solo Cup factory is still felt a decade later. But most at the opening of Brown’s installation expressed a preference for the site as is. They might like a restroom, a trail or two blazed through the brush, and maybe another informational panel. But what could it become that could be better than what it is now—a place where every visitor feels like the first person to discover the city’s “greatest physical and most sublime historic resource,” as architect Dan Wheeler once called it? So Brown is saddled with a hard task. Why make a sculpture about a sublime sculpture? It’s a little bit like dancing about architecture, as the saying goes. But what’s wrong with that? In September of 2016, Erica Mott Productions staged a dance performance on and around the walls. The walls can complement an artist, even if they’ll always overshadow. By 7pm on the night of the opening, almost everyone has left. The remainder know Brown well, and sit on the grass looking south from the site. Birds swarm back and forth, until the entire flock tries to settle on the one small tree in the center of the field. The friends joke that they won’t fit. It’s true: birds can’t build big walls like we humans can. They have to make do with the few trees afforded to them. But expert-level rebar knowledge aside, humankind faces a similar dilemma. There is no blank slate. The flock has to work with what’s been given. But at South Works, at least for now, the past makes for a nice Saturday in the park. Lewis Page lived in Hyde Park for four years. He has written about shipwrecks, WHPK, and the Southeast Side. He is now based on the West Coast. THANKS TO STELLA BROWN AND LEWIS PAGE FOR CREATING THE ART AND REPORTING ON IT, SO THAT, WE-THE PEOPLE (AT LEAST, SOME OF US) CAN GAIN AN APPRECIATION FOR THE INGENUITY, ARTISTIC SKILLS, WRITING ACUMEN AND MORE. PERSONALLY, I WAS INTRODUCED TO THIS CURRENT PROJECT AT THE SOUTH WORKS–A PLACE I DRIVE THROUGH WITH FRIENDS ON A MONTHLY BASIS–AND LEARNED A LOT ABOUT THE PROJECT AND THE VARIED REACTIONS OF FIRST HAND OBSERVERS AT THE OPENING OF IT. ONCE AGAIN, I WAS MADE GLAD THAT THE SOUTH SIDE WEEKLY PUBLISHES ARTICLES OF INTEREST THAT ONLY AN INDEPENDENT, NOT-FOR-PROFIT, VOLUNTEER DRIVEN ENTERPRISE, THAT IS EDUCATIONAL IN NATURE AND NOT PAYING HOMAGE TO GREED AND AVARICE, SUCH AS YOURS, CAN PROVIDE. PLEASE CARRY IT ON AND MOVE FORWARD WITH YOUR WORK!